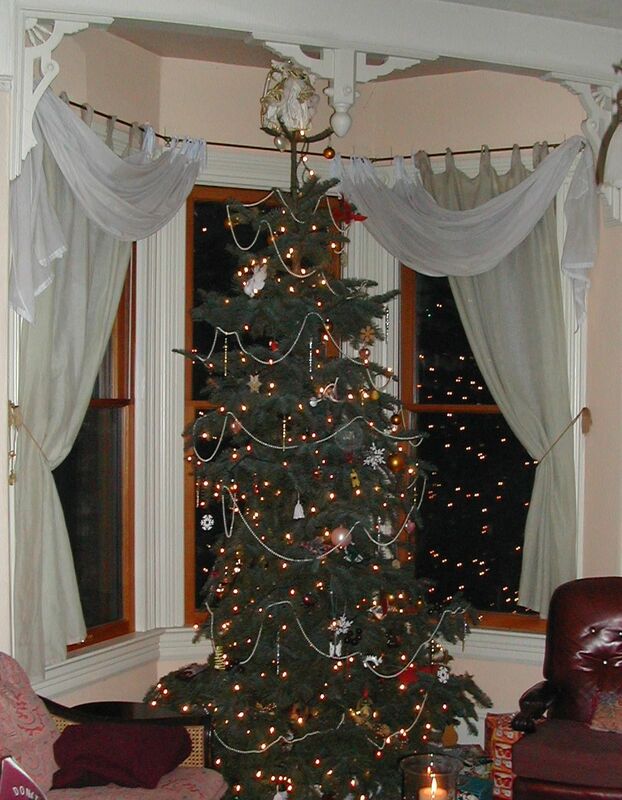 When I was living in Portland, a favorite annual activity was spending a December day driving out into the country to find the right tree farm, and then selecting the perfect Christmas tree for my Victorian home. I included several friends in this fun activity. Then after we’d selected our trees, we went back to my house for a batch of my chili. I started this tradition when I was living a vegetarian life style, and I still prefer my chili without meat. In the early days or my Christmas Tree tradition, I used canned kidney beans, but in later years, I’d learned how to sprout and cook the dried beans. Now I like to use a mix of beans, including kidney and pinto, and whatever else interesting I can find. I also like to use LOTS of chili powder and cayenne. I like it so hot it makes my eyes cross. But in the recipe presented here, I’ve been moderate with these; you can add more as desired. An excellent accompaniment for chili is corn bread, with lots of real butter and a bit of raw honey. Refer to The Cook’s Thesaurus (2,3) for a great description, with pictures, of many different chiles, both fresh and dried. It also suggests reasonable substitutes if you can’t find a particular chile. This is my own recipe, and makes a small batch to serve 3 – 4, but the recipe can be easily doubled. You can also include black beans and other varieties of red beans. The more varieties, the better the flavor. This is a vegetarian recipe. If you want to add meat (ground, or thin slices of steak), brown about 1 pound in the olive oil with onions and garlic, or brown separately in lard. 1 pound fresh tomatoes, chopped (or chopped canned tomatoes). Cover beans with warm water. Stir in whey or lemon juice and leave in a warm place overnight (24 hours). The longer they soak, the shorter the cooking time. Check after a few hours and add more water as necessary. Drain beans, rinse and put in saucier or stock pot along fresh water to cover by 2 inches. Boil for 10 minutes (very important, to ensure soft beans, and to destroy a toxin in kidney beans) and skim. Add ½ Tbsp. olive oil and garlic. Simmer gently until beans are tender, 1 – 3 hours. Add more water as needed to keep beans covered. About 20 minutes before the beans are done, add about ¼ tsp of salt. At this point, you can keep going, or transfer beans and cooking liquid to refrigerator, to make the chili later. While beans are cooking (or reheating), chop onion and mince the garlic. Seed and chop the chiles. Chop bell pepper and set aside. Warm olive oil in saute pan over medium-low heat. Add onion and garlic; saute until soft, stirring occasionally. Add chili powder, salt, cumin, baking cocoa and dried oregano, stirring to combine. Cook one minute more, then add to beans. Add tomatoes and chopped bell pepper. Simmer about 30 minutes, stirring occasionally. Check seasoning, adding more chili powder, sea salt, black pepper and cayenne as desired. Serve with grated cheddar or Mexican cheese, or sour cream, and freshly chopped onion or scallions. This entry was posted in Alcohol, Chocolate, Cocoa, Fat or oil, Herbs, Legumes, Onion family, Simmered, Soaked, Spices, Sprouted, Vine veggies and tagged cayenne, chiles, chili powder, cider vinegar, cocoa, cumin, dried beans, garlic, onion, oregano, peppers, tomato. Bookmark the permalink.